In today’s Silicon Valley, engineering talent is as sought after by companies as gold was by the first prospectors in the Wild West. Talent is a company’s most important asset, so we decided to use LinkedIn’s data insights to discover which startups are grabbing the attention of San Francisco Bay Area engineers. In the Bay Area alone, there are more than 240,000 professionals on LinkedIn in engineering and related roles. They use LinkedIn to establish their professional profiles, build their networks and get the insights they need to be great at their jobs. They also use LinkedIn to learn more about companies of interest and their employees. This includes visiting profiles of employees looking for common connections, checking out LinkedIn Company Pages, and following companies using the LinkedIn Company Follow button to keep up to speed with relevant news and career opportunities. By focusing on companies with fewer than 500 employees on LinkedIn, and activity among Bay Area engineers between January and March, we can surface insights into which startups are attracting the interest of this scarce talent resource. 1) “Big data” is big. LinkedIn knows how valuable big data is and our own big data powers this blog post. 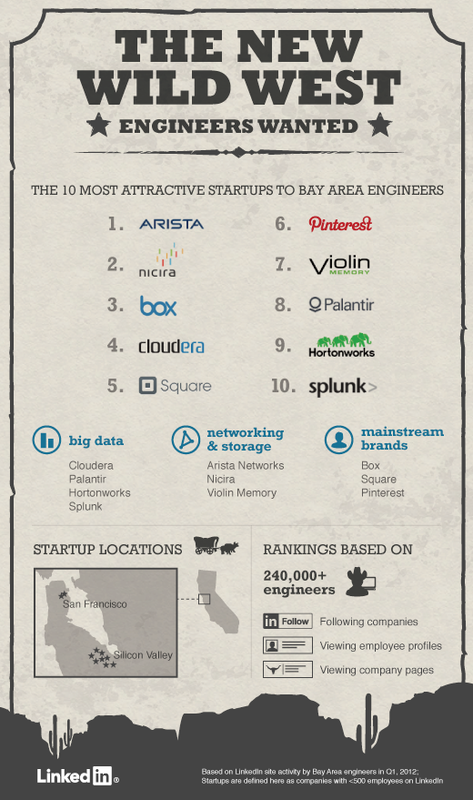 And it seems Bay Area engineers are looking to embrace similar opportunities, propelling big data companies to four of the top ten spots (Cloudera, Palantir, Hortonworks, & Splunk). 2) Networking matters. Our top 2 tech startups, Arista Networks (hardware) and Nicira (virtualization software), are taking different approaches to transforming networking, but are both red hot with Bay Area engineers. 3) Consumer brand carries over to talent brand. Box, Square, and Pinterest are well-known brands beyond the engineering community, blending strong consumer awareness with a growing employer brand. Ever changing. Silicon Valley moves at record pace, and since March already both Yammer and Instagram (being acquired by Facebook) have made impressive strides with engineers, so we’ll be keeping an eye on which new companies vie for a place on the leaderboard. Stay tuned as we continue to mine our data and dig up more nuggets to help better understand how companies beyond Silicon Valley can attract different pools of talent. If you’re interested in tackling some really big data, and think you can build brilliant products to connect talent with opportunity on a massive scale, we’re hiring.